Shirts With Random Triangles: Ohio State adds Columbus, OH long snapper Liam McCullough to 2015 recruiting class. Ohio State adds Columbus, OH long snapper Liam McCullough to 2015 recruiting class. 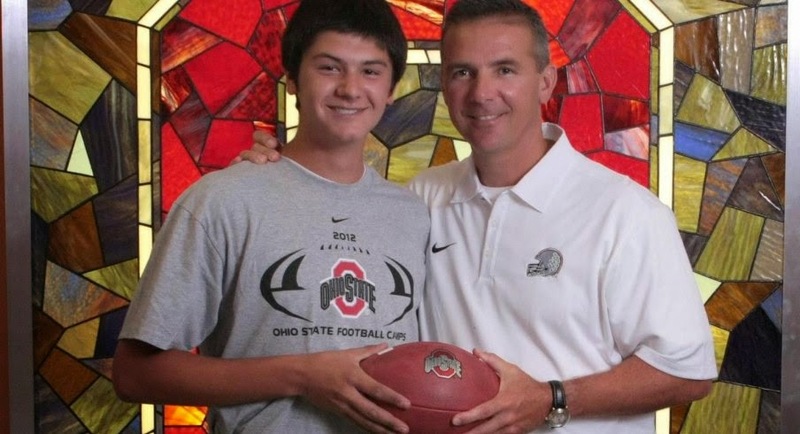 Liam McCullough with new best friend Urban Meyer. Via Eleven Warriors. Ohio State found the sixth member of its 2015 recruiting class close to home. Columbus, Oh. high school rising senior long snapper Liam McCullough committed to the Buckeyes' class of 2015 on Tuesday. Here is McCullough's announcement of his decision on Twitter. 247Sports.com ranks McCullough as the top long snapper in the country. The recruiting site's composite grades McCullough as a two-star long snapper. McCullough attends Worthington Kilbourne High School in Columbus, Oh. He stands 6'2, and weighs 205 lbs.